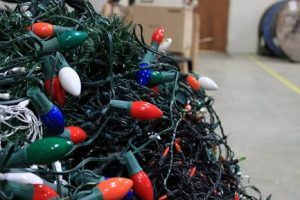 Did you know holiday string lights cannot be recycled in everyday recycling? Light strings not only contain a large amount of rubber and plastic, and sometimes glass, but also copper. These materials do not biodegrade easily, and copper is a valuable metal. 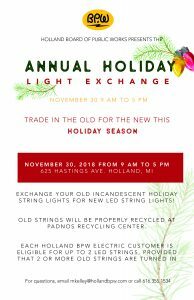 But by participating in the Holiday Light Exchange hosted by the Holland Board of Public Works, you are helping to reduce landfill waste. 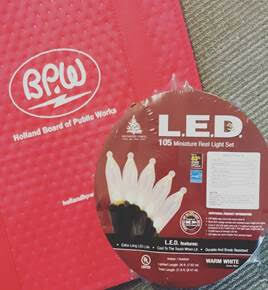 The Holiday Light Exchange is 9 a.m. to 5 p.m. on Friday, Nov. 30, in the Holland Board of Public Works Customer Service lobby at 625 Hastings Ave., Holland. BPW customers can come and exchange old incandescent holiday string lights for new Energy Star-certified LED strings of lights. U.S. Environmental Protection Agency. In addition, each customer will receive a nightlight and be able to choose a floodlight or a regular light bulb. Christmas lighting began as candles perched on Christmas tree limbs in 17th century Germany. Once the light bulb was created in the 19th century, string lights followed fairly quickly. The tradition of elaborate string light decoration developed throughout the 20th century. A 2008 U.S. Department of Energy study found that decorative holiday lighting accounts for 6.6 billion kilowatt hours of electricity consumption across the country. This equates to running 14 million refrigerators and exceeds the total electric consumption of many developing countries. That energy use can be trimmed. In recent years, Americans have switched to LED string lights, which use at least 70 percent less energy than incandescent strings. In addition, unlike incandescent lights, LED strings do not have filaments, which can heat up and burn out. LED strings of lights last much longer, are sturdier, emit little to no heat, and still have a warm glow. They also save you energy and, therefore, money, are safer overall, and are better for the environment. The DOE states that a single strand of LED lights can last up to 40 years. And it costs 27 cents to light a 6-foot tree for 12 hours a day for 40 days with LEDs versus $10 for incandescent string lights. In addition, up to 25 strings can be connected without shorting a circuit due to their efficiency. Holland BPW customers recycled 237 pounds of string lights in 2016, and 661 pounds in 2017. Help us make it to 700 pounds recycled this year! See you Nov. 30.  Morgan Kelley is conservation programs specialist at Holland Board of Public Works and leads the residential energy waste reduction and water conservation programs. 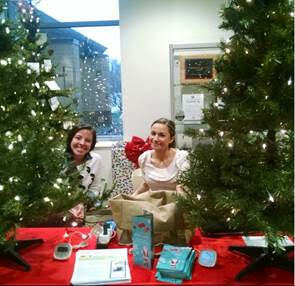 Next Next post: LIVING SUSTAINABLY: Have yourself a merry greener Christmas!